A first grade teacher was having trouble with one of her students. One day she asked Wilson what his problem was. The teacher took him to the principal’s office and explained the situation. 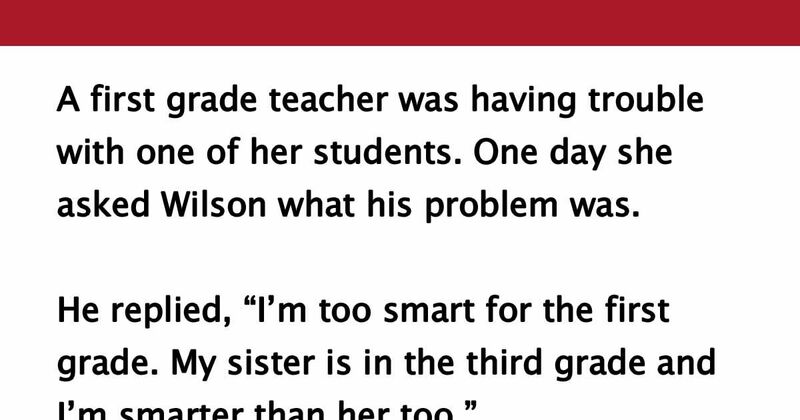 The principal told her that he would give Wilson a test, and if he failed to answer one question he would have to go back to the first grade and be quiet. The teacher and Wilson both agreed. “What is 3 times 3?” asked the principal. The teacher asked if she could ask him some questions too. The principal and Wilson agreed. “What does a cow have four of that I only have two of?” The teacher asked. Did you get them wrong too? SHARE if you enjoyed this!